Beautifully restored historic four-story brick townhouse offers private access to guestrooms off its Victorian central stairway. The spacious guestrooms are equipped with private granite-tiled baths; a pantry and wet-bar; comfortable queen size beds; direct-dial telephones; and individually controlled air conditioning. 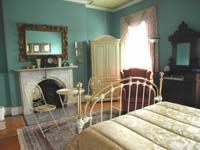 Each of the rooms is beautifully decorated in unique color schemes and is filled with lovingly restored antiques and appointments that evoke memories of the home's original era. (One room has a working fireplace.) Private baths, A/C- window, TV in some rooms, Phone, Non-smoking, Continental breakfast, 2nd - 3rd - 4th floors, $100- 175. Weekly rates available.